Gotrax is a relatively new Denver based company that focuses on creating hoverboards, electric ATVs and electric scooters. It has quickly risen to the top of the ride on market with a mission to produce “electric rideables that boost imaginations and the possibilities for personal transportation.” This vision and mindset shows the company’s commitment to innovation, creativity and ingenuity as they attempt to create the best experience for users of all ages. Gotrax offers a number of great rideable products. One such great product is the Gotrax Hoverfly Eco. 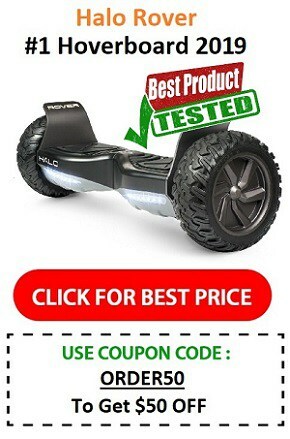 Understandably for the price, the this is not the most spec or technology heavy hoverboard in the market. However this doesn’t make it an inferior product by any means. It is an affordable, lightweight and eco-friendly hoverboard that offers riders of all skill levels an easy to use product for their transportation needs. 2 What’s good about the Hoverfly ECO? 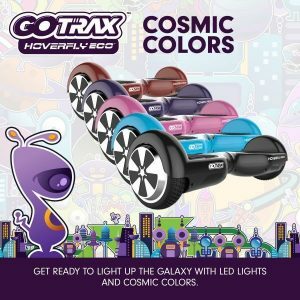 4 How does it compare to other Gotrax hoverboards? 5 Is it safe for kids? 6 So Is It Worth The Investment? As stated above, the this is one of the more affordable options available from this company. With this in mind, the product does not come with a lot of the features present in some of the more advanced hoverboards in the market. Features such as a dedicated mobile app and Bluetooth speakers are not found in this model (which would add significantly to the price), however it does still have more premium features such as LED lights and a learning and training mode. As you can see, the specs are very much standard for a 6.5 inch hoverboard – its got a decent speed and range, is lightweight and easy to carry, and is as good as many higher priced hoverboards with similar specs and features. What’s good about the Hoverfly ECO? Light and portable with a net weight of 19.8lbs. Wide range of usability with a maximum weight of 220lbs. Fresh and funky design with a wide range of colors including: Alien Green, Neptune Blue, Nebula Black, Mars Red, Pulsar Pink and others. Superb affordability, especially with the number of features the hoverboard has. Quick and easy training mode to help beginners master the basics of operating a hoverboard. Super-fast charge time of 1.5 hours. Good maximum speed (7.4 mph) and maximum range (12 miles) for a product within its price range. 0 degree turning radius, non-slip foot pads and protective bumpers to ensure a smooth and safe travelling experience. Does not allow for users heavier than 220lbs – this is standard for 6.5 inch hoverboards though. 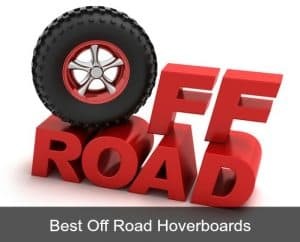 For a hoverboard that carries a heavier weight you’d need to look at the more expensive range of off road boards currently on the market. It doesn’t have a mobile application or bluetooth support like some of the newer models. A hoverboard at this price point won’t have “bells and whistles” like this, but if you’re buying for a child or younger teenager (and this brand does tend to be aimed towards the younger generation) this probably won’t be an issue anyway. How does it compare to other Gotrax hoverboards? This company offers three hoverboard models, each with their own set of features and specifications. Below is a comparison of the Hoverfly Eco to the other models, namely: The Hoverfly XL, Hoverfly Plus and the Hoverfly Hoverboard. 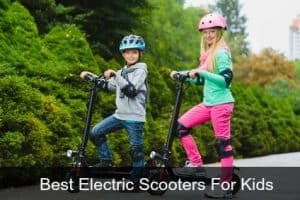 They also manufacture an electric scooter, electric atv and more. This is the largest model within the Gotrax range of hoverboards weighing in a 27.8lbs, a whole 8lbs heavier than the Eco. With an extra 2 inches of tire size, at 8.5 inches, this super sturdy model is suitable for a wider range of terrains than the smaller Eco model. In terms of power and performance, the XL has dual 350W motors compared to the dual 250W motors of the Eco. However, due to its larger frame and size, this does result in any added bonus to maximum speed (7.4 mph), maximum range (12 miles) or the maximum load weight (220lbs). With regard to features, the XL offers mobile app support as well as Bluetooth speakers, allowing riders to listen to their favorite music while travelling. The Hoverfly Eco does manage to offer a wider range of color options than the XL, with a total of 6 color options as opposed to 3.
the XL, the Plus has 6.5-inch tires similar to those of the Hoverfly Eco. Unlike the Eco, the Hoverfly plus has full mobile app support as well as Bluetooth speakers, making it essentially a smaller version of the XL or a more feature rich version of the Eco. The Plus offers a wide range of colors offering a total of 5 colors, only missing the Alien Green color. 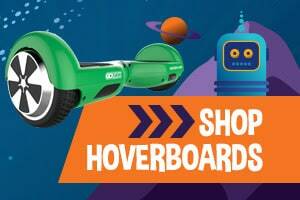 The last hoverboard in the range is the Hoverfly Hoverboard. This product is very similar to the Eco model both in terms performance and features. This model offers the same maximum speed (7.4 mph), maximum range (12 miles) and maximum load (220lbs) as all of the other models. The overboard is a lot heavier than the Eco, weighing in at 27.5lbs as opposed to 19.8lbs. Features wise, the Hoverfly has the exact same list of main features and manages to have LED lights and the same training mode. In addition, this does not come with mobile app or Bluetooth speakers. The Hoverfly offers the exact same number of colors as the Plus model at 5, also missing the Alien Green version that the Eco model offers. This hoverboard was designed with safety in mind, and is especially good for kids. All electric, battery, and charging systems have been tested and awarded the UL 2722 certification by Underwriters Labs (UL) to ensure the safety standards for e-Mobility devices. It also has a number of built in safety features such as non-slip foot platforms, rubber bumpers, and system features including Auto Shutdown all for the added protection of the user. All in all, the Hoverfly Eco is a superb hoverboard product especially due to the fact that it sits on the lower end of the price range. 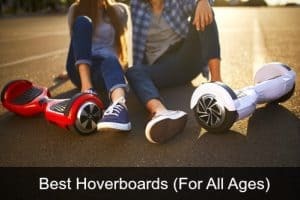 The super affordable, light weight and high performance hoverboard is the perfect product for people looking for a general use hoverboard and are not too concerned about modern features such as Bluetooth speakers or mobile apps. Because of the light weight and easy to use nature of the product, it is very suitable for use by children or other inexperienced hoverboard riders . However, for those heavier than 220lbs or for those who require additional features, then this hoverboard may not be for you, especially when a few extra dollars can get you the same performance but with extra features with a slightly better model.